Have you ever looked up Telekinesis on the internet? It’s a conglomeration of different ways of saying that there is no evidence to support such a claim. A waste of space if you ask me. Oh, and it covers related topics like bending spoons and metal objects, psychokinesis , and various other ways of avoiding the fact that, NOWHERE does it say that telekinesis is not possible. For those of you who don’t know, Tele = distance, and Kinesis = motion or movement. 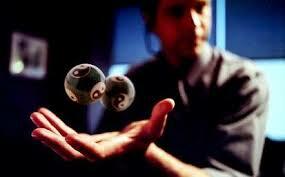 Telekinesis is the ability to move objects with your mind. That’s the laymen’s version. It gets much more involved when you start talking about the ability to affect things on an atomic level etc. This is an extremely difficult subject to write on, even though I know for a fact that it is possible. Mostly because of, all of the sensationalism involved. This ability (or gift) .has been written about, performed live, been depicted in hundreds of films, been the center of controversy in the world of Magicians, for hundreds, check that, thousands of years. Dating all the way back to Egyptians and their use of early forms of magic. It’s in the Bible, the most popular book, ever! You could say it’s in our DNA!! Personally, I have a long history in the world of Magic and Magicians (earlier July post on Magic and Magicians fore more info.) and I can say from experience that there are many ways to fool the human eye into believing that it’s witnessing a TK event. In fact, I’ve never met a Professional Magician who DID believe that telekinesis was possible. Mostly because the world of Stage Magic would be devastated by such a discovery. However, in my mind, there is no stopping evolution, and I believe that this ability is a part of the natural evolution of human beings. Hi Tony. I think telekinesis is fascinating. I think it is possible this ability is one that humanity can obtain, however, I am more skeptical that God would allow us to achieve this ability without his explicit gift at the resurrection…where we will finally put on our immortal bodies that give us access to new abilities like Jesus exhibited when he walked through closed and locked doors of the ‘upper room’ after his resurrection and appearance to his disciples. Scientists know that we are only able to access 10% of our brain’s functions. Just imagine if the 90% were accessible and the wondrous things we could achieve. I lean toward believing that only when we are changed into our spiritual immortal bodies will we have many new metaphysical abilities….like telekinesis, telepathy, self teleportation,k etc. Our limited 5 senses are made for flesh bodies, and the closer we can connect to our spiritual self that connects to God, then the inclination to such gifts are possible. It is exciting to think about the possibilities.